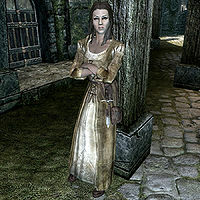 Vivienne Onis is a Breton apothecary who works at Angeline's Aromatics in Solitude with her aunt, Angeline Morrard. She becomes the owner of the store if anything happens to Angeline. Vivienne wears a belted tunic and a pair of boots. She is equipped with an iron dagger, and carries a key to her aunt's store, as well as a selection of common loot and gold. If you talk to her, Vivienne will bring up the topic of Roggvir's execution. She expresses satisfaction, stating that he deserved death, because without him helping Ulfric to escape the city after killing the High King, her cousin would not have had to risk her life in the war. She is referring to Angeline's daughter Fura Morrard, an Imperial Soldier who—as you discover in a side quest—has recently died in a Stormcloak ambush. After completing the quest, Vivienne's dialogue changes accordingly. Sorex Vinius reveals that he grew up with Roggvir and Vivienne and that the three were once friends. However, Roggvir ruined their friendship by teasing and bullying him once Sorex told him about his secret affection towards Vivienne. Angeline: "Vivienne, could you check out supplies of mandrake root?" Vivienne: "Which one is that again?" Angeline: "It's the root that looks like an ugly little man." Vivienne: "In that case, I'm pretty sure it tried to buy me a drink last night." This page was last modified on 25 October 2013, at 13:01.